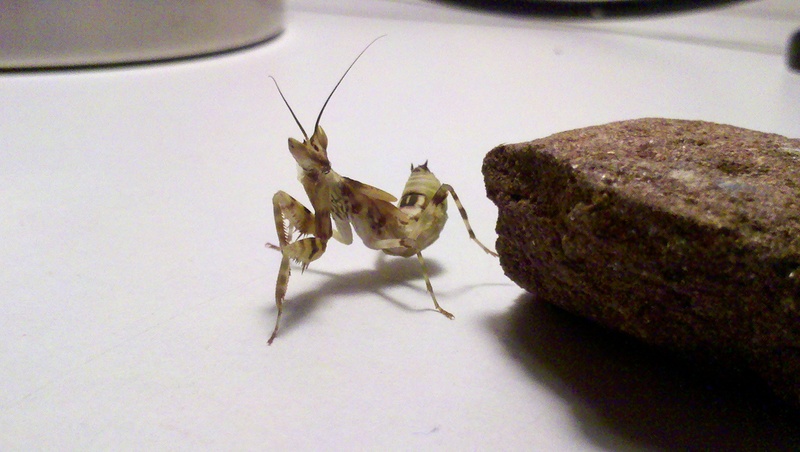 Preya was already an adult mantis when I got her, but she never found a mate. When she started laying oothecae, I was a very surprised 14 year-old! I then learned about parthenogenesis (Greek: parthenos-“virgin”, and genesis-“birth”) and self fertilization. Preya was with me from 2006-2007 for about 4 months. I ordered Artemis online frombugsincyberspace as a nymph. As you can see, she was tiny, and grew to become the beast she became. I took this picture about a month before she died in June 2010. She lived about 11 months and similarly, never having mated, underwent parthenogenesis and laid three egg sacks. Unfortunately, the oothecae proved to be sterile and unviable, as they still have not yet hatched. 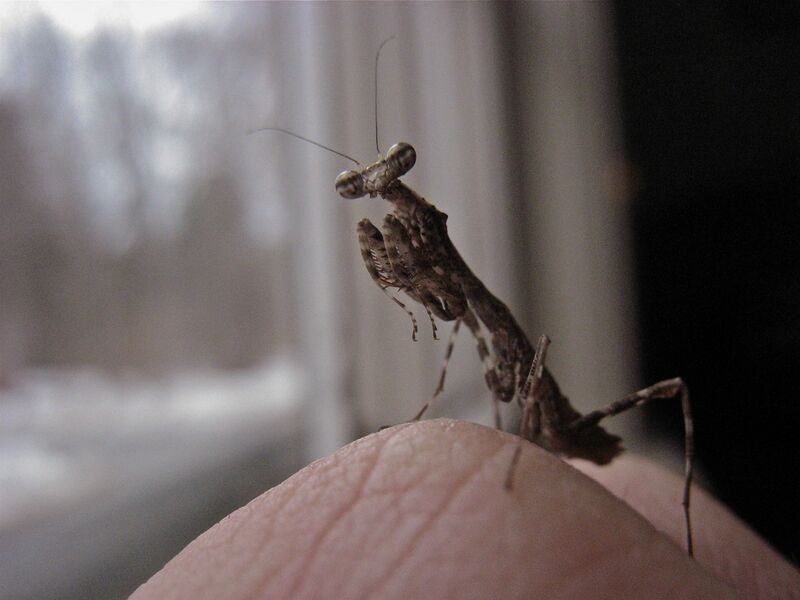 Then, during my freshman year, I ordered two more mantises. First I ordered another Giant Malaysian Shield Mantis. 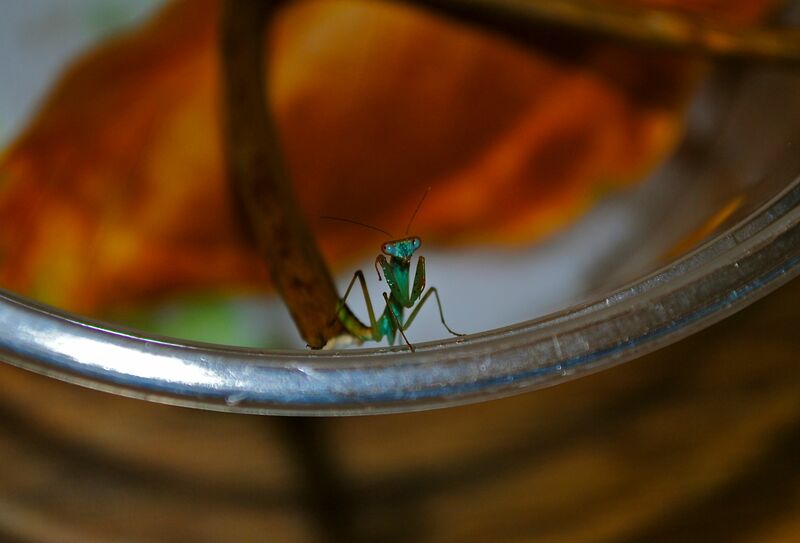 This mantis, who I named Metis, survived only one month before it became mysteriously lethargic, refused to eat, and died. Tragic, but inevitable- these creatures are ultimately adapted to a rainforest in Malaysia, not a college dorm room. 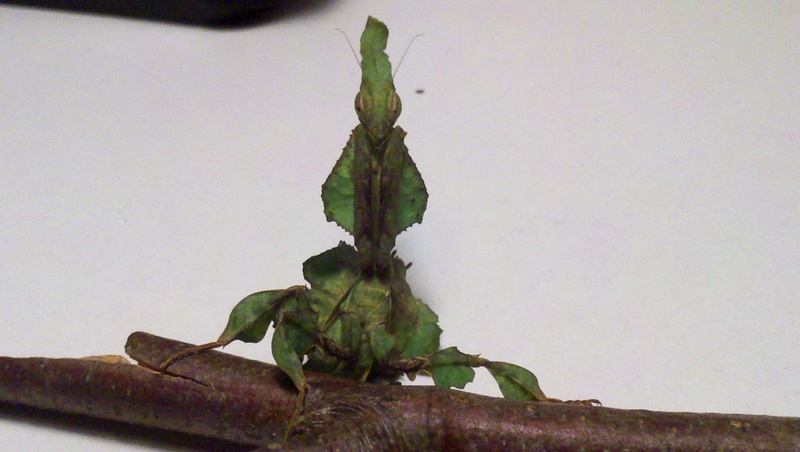 After mourning for a few days, I ordered another mantis, this time a Dead Leaf Mantis (Deroplatys Desiccata). 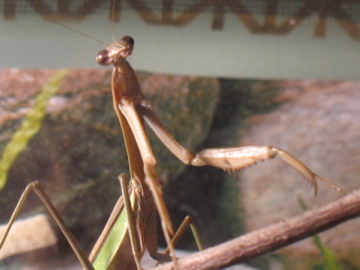 Again, this mantis lived for a month before succumbing to a mysterious ailment. While I may be to blame, I certainly took every precaution and provided the best care I could implement to keep him alive. Nobby lived about three weeks before passing. Darwin the Ghost mantis is with me now. She is about 2 months old, and will molt two or three more times before growing wings and becoming an adult. She is very regal- the epitome of a “sit and wait” predator, as opposed to a “chase and attack” predator. Her cryptic coloration and mottled exterior is reminiscent of a dead leaf, earning this specie the nickname the African Dead Leaf Mantis. Laugh, but Arachne (Spidey) actually just reminds me of an arachnid in the way he moves and acts. He has some very strange mannerisms and is skittish and small, not to mention tenacious! 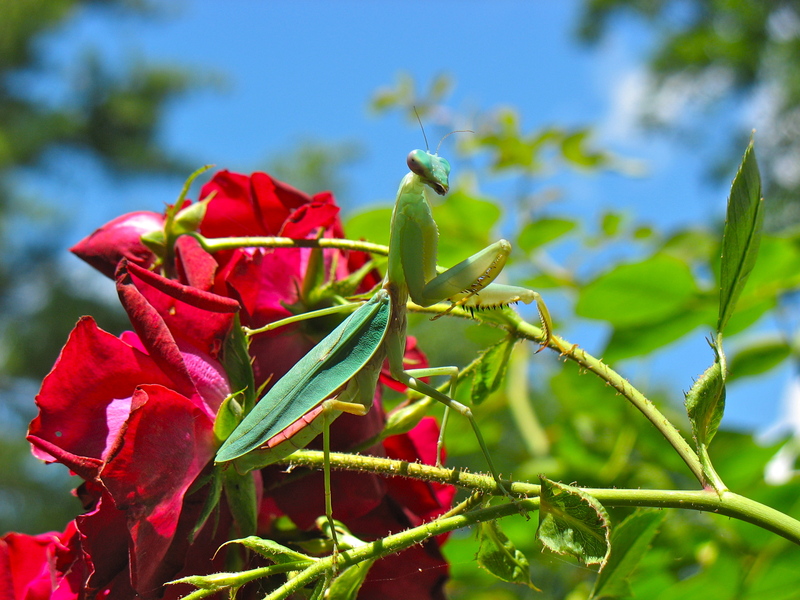 This mantis, more than any before, is willing to tackle insects that are more than twice its size. He will grow to be about two inches long and will have brilliant green wings after his final molt. You can see buds forming where wings will soon form in the picture below. For more photos, check out my flikr albums.